The Internet is filled with tons of video clips such as live streams, online videos from YouTube, Vimeo, Hulu, and other sites, music shows, etc. What if you want to save and watch them later but most of them do not offer a download option? One of the possible best ways is to use a streaming video recorder. In this article, we will start with a professional and efficient screen recorder and also show you the instruction on how to capture online videos on Mac step by step. Joyoshare Screen Recorder for Mac is a great screen recording tool that is capable of recording any video and audio activity on the desktop screen of Mac computer with high quality. These online video activities can be live streaming movies, video conferences, Facebook video calls, online radios, webcam videos, music games, and many other different types. Both system sound and microphone audio can be recorded according to your needs. With Joyoshare Screen Recorder, you can easily record online videos and other screen activities in a few clicks only. After that, you're freely to save the recorded video in any format like MP4, MOV, WMV, AVI, ASF, MKV, MP3, AAC, MA4, M4B, etc. or export it onto any mobile device such as Apple iPhone, Samsung Galaxy, Xbox, Smart TV, etc. Additionally, you can set the preferences as you like, for instance, select recording area, schedule recording task, set cursor effects, edit recording file, etc. Now let's learn how to capture streaming video Mac in high quality with Joyoshare Screen Recorder. Download this smart real-time video gripper right now and start to capture your web video by following the guide below. 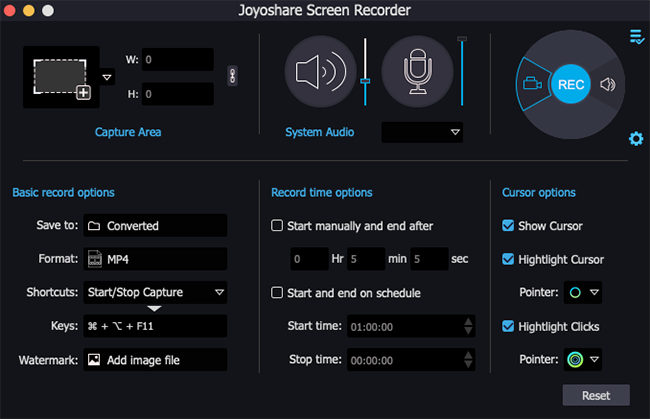 After installed Joyoshare Screen Recorder on your Mac, you can simply launch it. Now open the web page that contains the video you'd like to capture. Next go to the "Capture Area" section of Joyoshare and select an area for recording. There are two options for choosing recording area. You can just click the "+" button to personalize a specific recording size, or simply hit the triangle button beside it and select a suitable one from 320x240, 640x480, 1280x720, full screen, etc. Next click the audio icon to disable microphone audio recording in order to avoid unexpected noise during the recording process. Then click the Gear icon to customize capture settings, you can set output formats, change the output folder path, personalize shortcuts, add watermarks, change cursor option, based on your requirements. After all the settings are ready, now click the red "REC" button to begin the screen video capture. 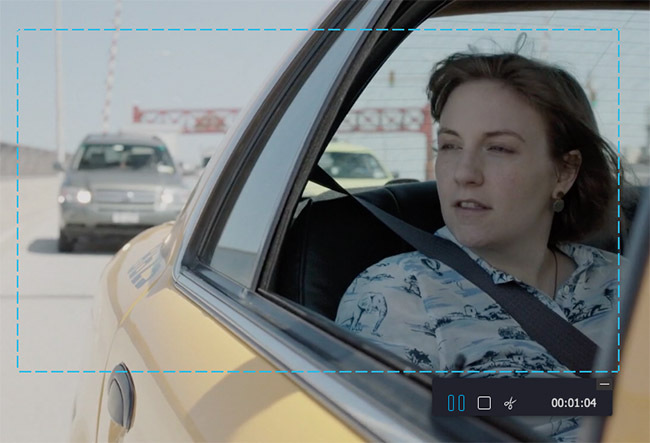 It will start after a 3-second countdown, so you can hit the "Play" icon to let streaming video commence to play. Wait when Joyoshare is recording online video from the web page. To finish recording, you can click the "Stop" icon and it will be saved to the "History" folder immediately. You can press on it and it will play on the preview windows. You can also edit the name and ID3 tags as you like. Record Screen in QuickTime? Here It Is!